The double “C” signature—recognised the world over by stylish men and women, and coveted for its undoubtedly impeccable fashion DNA, thanks in large part to the legacy of the forever chic, Coco Chanel, and the amazing talent of its current designer, Karl Lagerfeld. Chanel is not only valued for its distinct clothes — both the pret-a-porter and the couture lines — but also for its well-crafted and high fashion accessories, namely its sunglasses collection. You will find Chanel sunglasses to come in quite a few styles, with each one corresponding to suit your preference and need for spectacles. Whether you are looking to use the designer eyewear for lounging in your bikini on a beach in Spain or for walking about London in your best Chanel suit, you are bound to find the perfect pair to suit your need and taste. Of course, you may want to follow a few pointers so you can choose sunnies that will go well with your features, not just your outfits. The first step is to consider your facial shape. If you happen to have an oval-shaped face, you are blessed because then you can wear just about any sort of frame you want—from square frames with geometrical lines and CC signature from the Runway collection to the oversized round specs with the titanium-rimmed lenses from the high fashion brand’s latest collection. But do stay away from sunnies that are too large for your face. The rule of thumb for choosing the shape of frame is to go with ones that have features that are contrary to your facial features. If you have a square face, look for Chanel sunnies in oval or round shapes to soften your angular appearance. 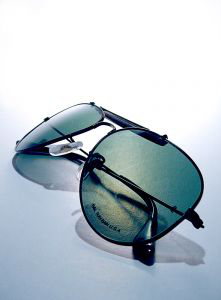 You can try the aviator titanium sunglasses with the CC signature and coloured lambskin tints (perfect for driving around the UK when the sun is out) from the Chanel Signature collection or the round acetate sunglasses with quilted temples from the Quilting collection. If you have a round face, go for angular prescription sunnies to balance the roundness of your face. You can try the square acetate sunglasses from the Camelia collection or the oversized square acetate specs with interlaced lambskin chains from the Chain collection. Finally, for sunnies that have a specific purpose, like reading, you should look for an eyewear shop that can customise your lens to fit your needs. The best optical shop will be able to help you get the ideal lens thickness (standard or thin) and lens type (single vision or varifocals) for your chosen Chanel frame. Abigail Mae Prescott is a fashion enthusiast and a freelance writer. She is very much interested in knowing the latest fashion trends nowadays, thus, she usually check out sites like http://www.fashioneyewear.co.uk/ and browse through fashion books and magazines.